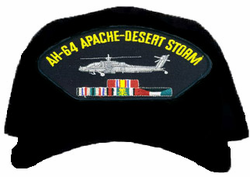 This AH-64 Apache Desert Storm Cap is a six panel, emblematic, cotton twill, dark under the visor, and fully adjustable cap. These are the same ball caps found throughout the Military. These Army caps make a wonderful addition to your collection or a great gift! Our ball caps are made in the USA and their quality is guaranteed.